By lineup alone, the first Festival Supreme wasn’t revolutionary. Sure, it was stacked. In fact, it looked like one of the best comedy fests ever curated, with huge movie stars (Adam Sandler, Zach Galifianakis), troupe reunions (Mr. Show, The Mighty Boosh), and some music festival veterans (Tim & Eric, Tenacious D themselves). But the actual vision of Festival Supreme was something more specific, and even more special. 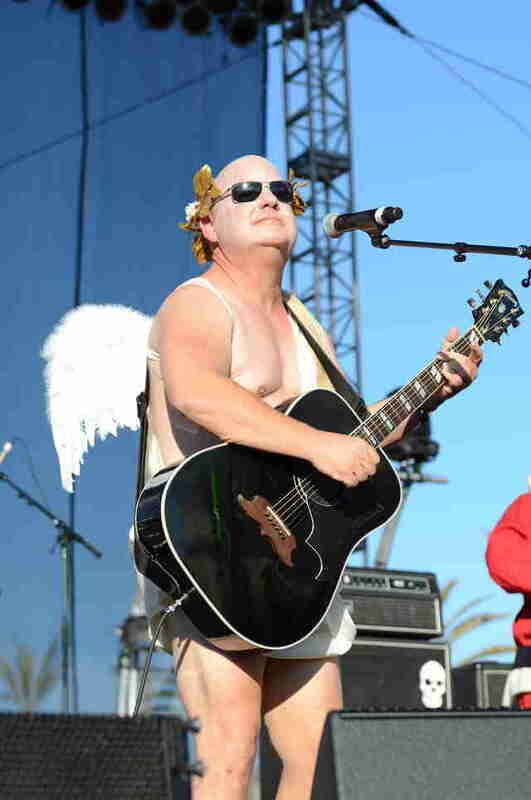 Tenacious D, otherwise known as Jack Black and Kyle Gass, had created an event in the same manner that Yahweh created Adam in the Old Testament: in its own image. Unlike most music festivals where comedy and music were segregated, here it was offered up simultaneously, the ethos of the band expanded to an entire event. Sandler brought his acoustic guitar and played songs. Fred Armisen appeared as character “Ian Rubbish” performing a set of punk songs. Maya Rudolph showed up with her Prince cover band Princess. The day was conceived with a vision that wasn’t readily apparent from just reading names on a poster. And that vision has persisted to what will now be its fourth consecutive year when Festival Supreme descends on the Shrine Expo Hall and Grounds on October 29th. It’s a run that has seen a dramatic improvement in execution, and a longevity that couldn’t have been predicted when considering the issues that presented themselves during the fest’s inaugural soiree at the Santa Monica Pier. Interestingly, the original vision and name for Festival Supreme were both different than their 2013 execution. “About five or six years ago, we started playing around with the idea of a Monsters of Comedy Rock Festival, a big throwdown with Flight of the Conchords, Spinal Tap, Tenacious D, and The Lonely Island,” Black explains by phone from Hawaii. “But we found out we couldn’t use the Monsters of Comedy Rock name because Gene Simmons from Kiss owns Monsters of Rock,” Gass adds by phone from Los Angeles. In terms of sales, the event was a big success, selling out with approximately 8,000 people attending. But issues were apparent before fans even entered the festival. “We thought one of the biggest problems would be parking,” Ceazan-Fleischli says, “but that wasn’t a problem. It’s annoying to park down there, but I think everybody knows that already. But getting into the festival was an issue. The lines seemed outrageous.” The queue stretched beyond the base of the pier, and served as a preview for the environment fans were about to spend several hours in. Tenacious D and their camp are still proud of that first year, to the point where Gass and Black aren’t quite anticipating discussing the hiccups that occurred. And they are right, in a sense. There were some amazing performances and some special moments that first year of Festival Supreme that shouldn’t go overlooked. The Lonely Island came out as a surprise guest during Tenacious D’s closing set, Eric Idle played with his own name by bringing out Billy Idol during his appearance, and David Cross and Bob Odenkirk’s revival of Mr. Show would end up as a preview for a full-fledged reunion for their eventual Netflix reboot. But The D are also realistic and know that certain aspects of the fest just didn’t work on the Santa Monica Pier. “Because we’ve been to festivals, too, and know how important that is for your comfort,” Gass adds. Ceazan-Fleischli also points to the issue with the standup comedy tent, where the idea of everyone floating around and just checking out a couple jokes doesn’t really work with the caliber of talent that they had. For the most part, people wanted to see an entire set, and the comedy was geared towards staying for the whole time. As for the toilets, she confirms that Black and Gass take their plumbing very seriously. “Jack and Kyle, when they themselves tour, one of the things that they find to be most important are the toilets,” she says. “It’s hard to get that much water in and out of the pier and the event was oversold, so the toilets pretty much had to be shut down. We got a lot of sad and pretty grossed-out feedback. Then there were technical issues of sound bleed from the main music stage into the tent hosting the sketch comedy. Some people singled out Adam Sandler for playing into Mr. Show’s set, but in reality his stage was just running late and he was merely finishing his allotted time. But the delay was noticeable enough that the performers struggled through it. 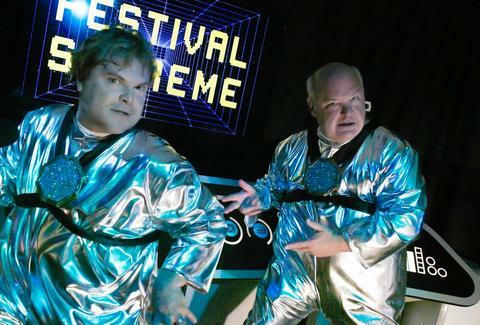 “We’re wary of doing comedy on these outdoor, bigger stages, because some of the subtler, weirder stuff we do can be lost,” says Tim Heidecker, who played Festival Supreme with Eric Wareheim as Tim & Eric for that first year. 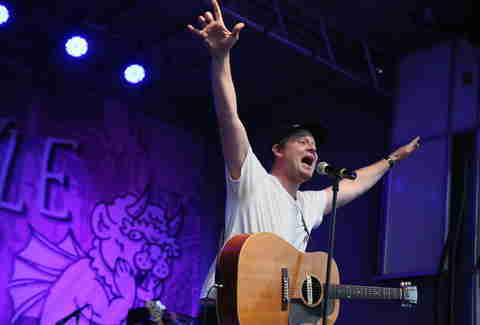 He also appeared as Heidecker & Wood in its second year, and is scheduled for a solo standup set this year. 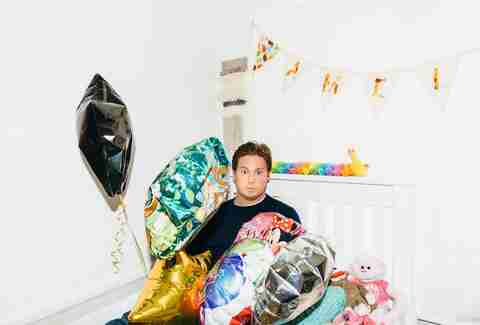 Heidecker notes that he wasn’t really pleased with his performance at that first festival, citing the sound bleed as well as the difficulties in playing in the cold temperature. “We’re not seasoned musicians, but I remember picking up my guitar at the beginning of the set, barely able to hear it, and what I could hear was wildly out of tune.” The pier’s strict curfew made Heidecker barrel through the issues, and he recalls being livid with himself for the circumstances. Had Festival Supreme been a typical music festival, these hardships would have been more easily overcome. Most music festivals are uncomfortable by nature, but beer, drugs, and mental preparation help make the experience tolerable, even fun. But for comedy, a certain level of comfort is required for things to be funny. It’s hard to laugh when you are packed in too tight, or when you’ve just missed an artist you were really looking forward to, or when you can’t find a reasonable place to poop. When Ceazan-Fleischli speaks about the 2014 installment, it’s apparent in her voice how much she hopes people who took issue with the first Festival Supreme came back to second. Another key to the Shrine’s success as a venue is the use of the Expo Hall, which Black points out is crucial in conveying their yearly theme, be it the dark circus of 2014, the Las Vegas lounge of 2015, or this year’s outer space motif. “I liken it to Ben-Hur because it’s this giant oval,” Gass says. And that’s exactly what happens at the Shrine. Two outdoor stages alternate between musical presentations, while the indoor spaces allow for retreats from the heat and the sun. If someone wants to sit down for a while, the Shrine Auditorium is available for that, with ample space to accommodate the crowd size, which has settled in at around 6,500 for the past couple years. “Moving to the Shrine alleviated all of our issues,” says Ceazan-Fleischli. “It’s the perfect venue for what we’re doing. The second year Jack commissioned his friend to design this circus of death. It was insane. There were two trains, there were all these performance artists, and there were art installations. A lot of people dressed up because it was near Halloween but not on Halloween. And settling into their new home allowed for Festival Supreme to highlight its biggest strength: booking some of the best comedy rock lineups ever curated. As to how Festival Supreme impresses every year with the artists they bring in, much of that has to do with the relationships Black and Gass have cultivated over the years, and the high bar they’ve set through their own creative accomplishments. This kind of esteem is why Festival Supreme is able to get big names to not only appear, but to be recurring figures. The 2016 lineup will see Sarah Silverman, Will Forte, Garfunkel and Oates, and Fred Armisen as just some of the talent making return trips to the festival. And that’s just what is properly billed. Festival Supreme has also made a habit of surprising fans with unexpected sets and appearances, a cue they’ve taken from promoter Goldenvoice’s most established property, Coachella. In its first year, unexpected guests included Conan O’Brien showing up with Triumph, the Insult Comic Dog, while “Weird Al” Yankovic appeared unannounced in year two. And for year three, fans got a surprise set from Reggie Watts, who also played the inaugural fest on the Pier. Watts fits a particular niche of comedian that also performs music, the blueprint that the festival is built on. But Festival Supreme also began offering music-first acts that also happen to be funny. This wasn’t really present in its first year, but has become a trademark of the event since it moved to the Shrine. Black mentions Beastie Boys and Devo as two paradigms of what they’d look for in their musical bookings. Be it comedic friends or musicians they admire, Festival Supreme never seems without a purpose. As Ceazan-Fleischli points out, “Jack and Kyle know every act and they know why they want them to perform. They have a reason for being there.” The door is open for the performers to try new things, to work without a net, and to embrace the moment. This has meant Aubrey Plaza doing an entire set in character as “Yolanda” or Amy Poehler subverting audience expectations by riffing as a reclusive singer-songwriter. It also means that Black and Gass reinvent Tenacious D from year to year, only headlining the first year themselves, trying out a jazz routine last year and booking themselves as DJs this year. 2016 will find Flight of the Conchords headlining the festival, a big moment for Festival Supreme since the New Zealand duo were one of the original acts The D wanted for the inaugural event. And beyond this year, the possibilities still seem wide-open, despite Reggie Watts’ initial concerns. “I remember thinking ‘how are they going to keep bringing more acts every year,’” Watts says, “because they’ll run out pretty quick.” And this does hit on the difficulty that might occur with a festival with such a distinct lane, that there is only so much that could exist within the music and comedy banner. But four years in and the bookings remain creative and exciting. Some comedians, like Armisen and Rudolph and Heidecker, have enough varying talents that multiple appearances can still feel fresh. Otherwise, Black and Gass still have a number of artists they haven’t been able to land yet, noting that Louis CK, Dane Cook, or their white whale, Spinal Tap. Ceazan-Fleischli is not ready to give up on Spinal Tap, noting that they want to do it, but there’s just a lot that happens in the Spinal Tap universe. “I wouldn’t rule it out, ever,” she says.